In my previous post I talked about the key lessons safe behaviour around food , equine emotions during training, head lowering & backing. Another key lesson I want to encourage all clicker trainers to teach their horse is ‘targeting’. Once your horse knows the target is meant to be touched with his nose (not lips or teeth), you can start experimenting. Hold the target a bit lower, higher, more to the left or to the right. If the horse is touching the target a solid amount of time you can put a verbal cue to this new behaviour, like ‘touch’. Targeting is a very versatile exercise and therefor a really good tool to have in your training ‘tool box’. Once your horse can target his nose to the target stick, you can shift the context: practice in other surroundings, use different objects, teach your horse to target with different body parts, et cetera. Targeting is an excellent way of starting positive reinforcement training with any horse. 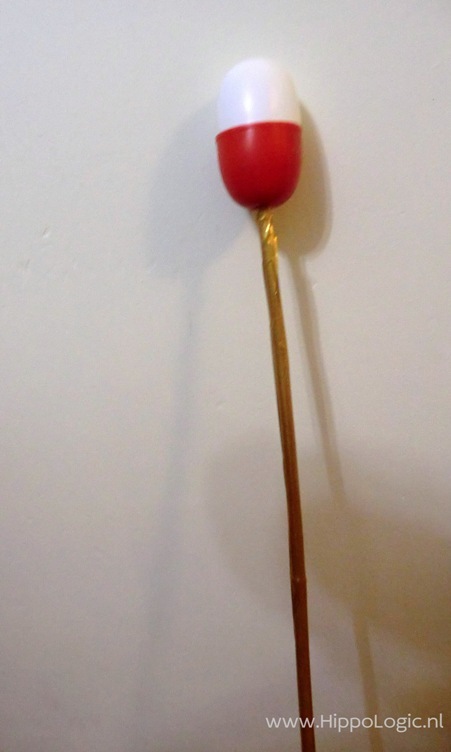 If you use a target on a stick you can create a distance between you and the horse. Therefor it can also be used to train (potentially) dangerous horses. With a target on a stick you can train your horse to move away from you, you don’t have to bend through your knees or stretch to ask your horse to touch low and high targets. I suggest working with ‘protective contact’, a barrier, when you start, especially with potentially dangerous horses. Then the horse can’t enter your personal space while you are still getting used to the mechanical moves of presenting the target, bridge, take the target out of the horses’ reach and present a treat. 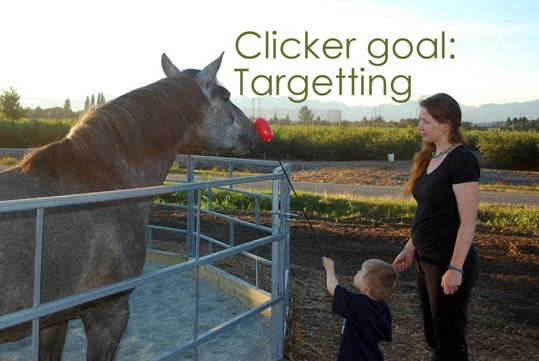 Once your horse knows how to target and you’ve put it on cue, you can use it to train other behaviours. If you hold the target stick a bit closer to the horses’ chest you can elicit a weight shift which can be shaped into backing up. Also the opposite can be achieved and targeting can be used to teach a horse to follow you or being lead. You can teach a horse to lower his head. If your horse can target different object with different body parts the uses are endless: medical (targeting the mouth for oral medication, eyes to your hand in order to treat infections, ears etc), dressage exercises, de-spooking, hooves for trimming and so on. Read here my post Targeting for advanced uses. In clicker training we use a ‘click’ as bridge signal to communicate to the horse that he has done something wonderful. Immediately after the click we deliver a reward to the horse. How do you start teaching what the click means? You need a bridge signal or an unique sound, like the click of a clicker, a tongue click or a unique word. I prefer a clicker because that always sounds the same and it is very quick to deliver. The bridge signal connects the click and the time it costs to deliver the reward. Rewards. Choose your horses favourite treats. Even if they are not very healthy, you want to choose a treat that has a high value to your horse. Something that will get their attention. Reward pouch/bucket. You need to stash your reward in a place where you can access them quickly but in a place out of reach of your horse. A money belt or an accessible pocket will work, or a bucket. Place the bucket on a chair so you don’t have to bend over every time you need to reach for a treat. Make sure your horse can’t reach it or start training ‘ignore the food bucket’. Barrier. If you want set up your horse and yourself for success, start training with a barrier between you and your horse. A fence or stall door prevents the horse coming into your space to get the treats himself. You set yourself up for success if you don’t have to handle your horse or a lead rope and a clicker and the treats, all at the same time. 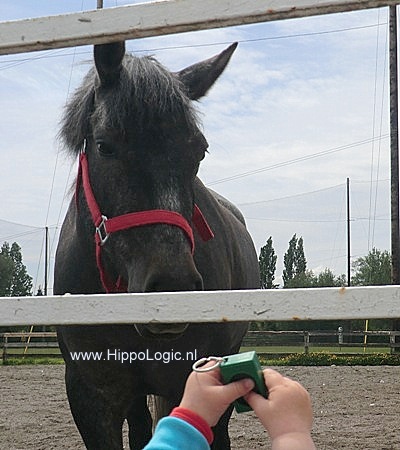 When you want to start clicker training you will have to introduce the click sound to the horse. You also need to teach your horse that this sound has a meaning. You can just start with a click & reward your horse. Deliver the reward as soon as possible after the click. The quicker the reward is delivered after the click the sooner the horse will associate the click with something positive coming. With ‘soon’ I mean within 3 seconds or even faster. It can be almost simultaneously: click&reward. Make sure the food always moves towards the horse, so the horse never has to come to you to get it. Make it a habit to feed with a stretched arm, so the distance between your pocket (the source of the treats) is as big as possible. Deliver the treat straight to the horses mouth, so he doesn’t have to search for it. This prevents frustration and mugging. Deliver the treat as fast as possible to prevent mugging and frustration. Make sure the treat is a reasonable size, so the horse can easily find it and it doesn’t get lost. Count your treats and always check if you still have a treat left, before you click. Click first, then reach for the treat. You want your horse to (re)act on the sound of the click, not on your hand reaching for a treat. In general it takes 30 – 50 clicks until the horse has learned that the click has a meaning and it means something positive. Most horses show interest in the click much sooner and you can already start to work on specific (easy) behaviours. The horse now wants to figure out if he can influence the click by his behaviour and that is the point where you can start clicking purposefully for a certain behaviour. Now you can give your horse a break until the next training session. Read also 5 Tips for Starting Clicker Training.